This extraordinary oil, formulated specially for face, neck and hands, helps revitalize skin with a rich combination of nutrients. Known as The Tree of Life, Moringa helps fight skin fatigue by delivering a healthy supply of fatty acids, Vitamins A, B, C, & E, and antioxidants. Considered to be one of the greatest cosmetic oils discovered, Moringa Seed Oil is blended with Jojoba Oil to help enhance skin’s texture and glow. Rose Hip Oil, rich in GLA fatty acids, adds remarkable skin-restorative properties to this powerful natural trio. LOVE this combination. I have been adding a few drops to my conditioner. In the winter I add a drop to my styling cream and leave-in conditioner and if I want a bit of shine to my (curly) hair, I add a drop and scrunch into dried hair! My stylist has even asked what I am doing differently. Many compliments! A drop or two goes a long way. I will also use this combo oil instead of body cream, especially during those cold Canadian winters! 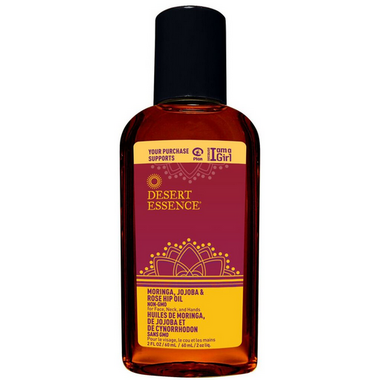 Bought this primarily for the jojoba and rosehip oil combo hoping for well-hydrated hands and possibly fading of some spots. A few weeks in and I'm finding that I achieved much better results with sweet almond oil. This product also contains orange peel oil which is an irritant for anyone with sensitive skin -would not have purchased if I had known it was included. Not an impressive combo oil for me, definitely will not repurchase.